All righty, this adventure for levels 4 – 5 clocks in at 52 pages, 1 page front cover, 1 page editorial/ToC, 1 page SRD, 1 page advertisement, 1 page back cover, leaving us with 47 pages of content, so let’s take a look! All right, so this is an installment of AAW Games’ A-series of adventures, which means that they are set in the world of Aventyr. It also means that they are pretty much canon and thus, they usually are penned by the most seasoned veteran writers of the AAW Games crew. The series as a whole is very evocative and interesting, so let’s see if this module holds up! As you know, this is an adventure review. As such, from here on out, there will be a ton of SPOILERS. Players who wish to play this module should skip ahead to the conclusion. All right, only GMs around? Great! So, the seasons and control of the weather has been a theme of sorts for the A-series, which makes sense, considering the shamanistic leanings of the unique Vikmordere-culture; the seasons are incredibly important and, in fact, the weather also plays an important part here. We once more visit the frontier village of Rybalka, outpost of the mighty Klavekian empire in the Vikmordere valley. It is this outpost that is once more ravaged by the brunt of the elements and worse, as a tragedy that has turned into history bears fruit. The local Vikmordere tribe, the Snoqua, know of a mighty tree, imbued with the primal, elemental forces of the seasons; during the Klavekian incursion, the council of druids, elders, etc. decided that they would need to do something about the mighty magical tree. The invaders showed no care for custom or lands as their mining operations cut swaths into the majestic forests – thus, a plan was devised, one that would lead to the creation of the eponymous Flute of the Four Winds – a branch of the tree, one that, by law of sympathetic magic, would carry its power. The magic power removed, the invaders never grasped the significance of the once sacred site. Unfortunately for the Vikmordere group designated as guardians of the mighty relic, the Klavekian soldiers littered the landscape, forcing them to take shelter in a cave system…one that was inhabited by lizards with a strange hive-mind. Beset on two fronts, the shaman and wife of the flute’s guardians, Shertayli, fell in battle. This tragedy tainted the mind of the leader of the guardians of the flute, on Manahzo, who beseeched the council to allow him vengeance against the invading forces. Being denied, he and his disgruntled band of Snoqua Vikmordere left tribe and area behind, to wander into the mists of legend and time. After the attack, the somber task of assessing damage is up next: The PCs are part of the emergency meeting, where sage Yuri Statel plants the seed of dissent: He suggests vengeance against the Snoqua tribe, a people that already have a tenuous peace with the mostly Klavekian denizens of Rybalka – in fact, the extremely smart man may have planted suggestions (not italicized in the text) prior to the meeting, so yeah, it won’t be simple to dissuade the Rybalkans from the course of retribution, at least not sans proof. Thankfully, it falls to the PCs to undertake the scouting assignment – and after the meeting, Sulwotik, a former Vikmordere, contacts the PCs to fill them in on the very likely innocence of the Snoqua. In fact, perceptive PCs may have noted that it was he that controlled the mighty totem golems. 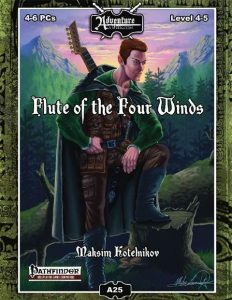 He also fills the PCs in regarding the flute of the four winds as well as Manahzo’s exile – this section is particularly important when not playing this with players already familiar with Rybalka and thus maintains a broader appeal. The next task for the PCs would then be to walk into the wilderness (random encounter table included) and find the Snoqua tribe; curiously, beyond the dangers of the wilderness, there is a significant likelihood that Statel will be crying them, adding a layer of potential paranoia to the proceedings that are pretty much guaranteed to be tense when the PCs are surrounded by the Snoqua’s warriors. Thankfully, Sulwotik’s name carries weight with the tribe, and thus the PCs get to participate in a mystical ceremony; in the aftermath, the location of Manahzo is revealed – he is actually on a high ridge atop Rybalka itself! Here is the problem: In order to reach the ridge, the PCs will have to brave the notorious Dark Wood, a place where infernal powers have corrupted the natural order of things. It is here that the PCs will be attacked by Arakel, the demonic wolf and her pack, ally to Manahzo and his Dark spirit. When the wolves have been vanquished, the PCs will see the massive storm resuming – and as the PCs venture nearer, the mighty Vikmordere prepares his last stand…and as the PCs are obviously to formidable a match for him, he jumps to his death. This ends the module, right? Wrong. This is basically act one. Rybalka resumes a state of vigilant calm in the aftermath of Manahzo’s death, and while the local populace treats them well, Statel is not so easily deceived and, as an agent of the Klavekian crown, suspects complicity. The flute broke in the fall, becoming mundane and bereft of magic, so, as far as all are concerned, this seems to be the end of Manhzo’s misguided revenge. That is, until 3 days pass. Suddenly, non-Vikmordere people of Rybalka are targeted by a rather deadly phenomenon: They hear the sound of a flute playing, right before being buffeted by air geysers or even struck by lightning! It’s not over yet, and thus, Sulwotik counsels that the PCs once more travel to the Snoqua to deal with the issue….hopefully in a diplomatic manner, for they were expected to return the flute, now broken. The Vikmordere have an idea on how to put the horrific haunt that is threatening to annihilate Rybalka to rest: They know that Manhzo was never able to reclaim the body of his lost love Shertayli. Thus, the PCs will have to travel to the gloomy coal mine (which belongs to the guy Yuri manipulated in the meeting, just fyi) where she has met her fate. The mine is a pretty amazing dungeon: For one, it is extensively mapped: A vertical mineshaft, with the tracks descending in a spiral pattern, for example, features a full-blown and proper side-view map. A total of 5 full-color maps are provided for the mine, including grid-less versions and ones with grid, for full player-friendly action. The maps are also very detailed, sporting spider-webs, tracks, etc. – depending on your own drawing skills, the cartography alone may be worth the price of admission here! Things become even coaler…her…cooler here, though: There is a vast amount of coal dust in the air, which makes the proposition of handling fire pretty dangerous. A handy table lists the percentile chance to ignite a 10-ft.-cube at the source of flame, as well as at longer ranges. I LOVE dungeons that sport such unique, global mechanics and the table and principle is one that is convenient and easy to both scavenge and adapt to your needs. The workers in the upper reaches of the mine are not exactly friendly folks, but they can also warn the PCs of the spider infestation in the lower reaches, where “The Dark Lady” awaits, a giant black widow. There is danger beyond her lurking in the depths, though: An agent of Yuri has prepared an ambush and may require that the PCs deal with him…oh, and the guy is no saint: A murder victim of his may be found, the spirit of the dead miner put to rest, provided the PCs care enough. Ultimately, the PCs will have to venture into abandoned sections of the mine, where the PCs can find wondrous “flowers” – really anglers, weird, subterranean predators. Oh, and the tunnel horrors and their queen await beyond a mushroom garden, making for a nice boss battle. Securing Shertayli’s remains, the PCs may return to the Vikmordere, have them consecrated, and thus end Manahzo’s thirst for revenge. Yuri, meanwhile, bides his time – he’s not one to argue with results, and as long as the PCs seem to be interested in keeping Rybalka safe and under Klavekian rule, he will spare them further machinations…at least for now. It should be noted that the massive combat stat appendix not only covers the creatures, but also random encounter stats, etc. Editing and formatting are very good, I noticed no issues worth complaining too loudly about. Layout adheres to AAW Games’ aesthetically-pleasing two-column full-color standard. The interior artworks are high-quality full-color pieces, with only a few that I’ve seen before. The full-color cartography by Michael Allen is amazing in its detail; the fact that we get not one, but two arrays of player-friendly maps is a HUGE boon for guys like me, who can’t draw. In this case, the fact that the maps are this detailed for regions in the mine where no combat is expected also means that it’s very easy to create tension as the PCs explore the place…and if you’re like me, you’ll probably plan a follow-up return to the complex. Only few authors get to play in AAW Games’ A-series, particularly in the Rybalka region,and for good reason: The main draw of the series is the ability to evoke an incredibly concise and flavorful atmosphere unlike any you get from other publishers. There is a distinct complex of themes that constitutes Rybalkan adventures, one that is hard to pin down, as it happens almost imperceptibly. There is a touch of the wonder of fairy tales, of frontier’s spirit in these modules; there is a sense of wonder that is hard to describe, harder to capture. This is distinctly fantasy, sure – but it feels different from other adventures; it sports distinct themes. It is impressive that Maksim Kotelnikov (with additional content by Michael Smith) has managed to capture the essence of what makes AAW Games’ A-series stand apart. From a structural point of view, the emphasis on the clash of cultures is a great backdrop; the subtle intrigues are smart, and I particularly enjoyed how it bucks the clichéd structure of a revenge-plot and makes it about closure, about how it deviates from the “slay guy, done”-paradigm. This conscious deviation from expected structures also pertains the encounter-design in the mine – just because you would *expect* an encounter in an area that is truly remarkable doesn’t mean that there has to be one. You may not notice it consciously, but unconsciously, playing experience does carry with it such expectations – and when these are not met, it enhances the feeling of encountering something fresh. What could have been one-dimensional instead feels like a compassionate tale. Additionally, unlike many module or supplement centered around a clash of cultures, neither the Klavekians, nor the Vikmordere are truly bad guys – they are just different cultures, with both good and bad people. As a whole, this creates an atmosphere that is enjoyable to read and that leaves the reader with a satisfied, warm feeling. So yeah, I did enjoy this module, much more than I imagined I would, considering that this is, to my knowledge, Maksim Kotelnikov’s first published module. This is not a world-shaker of a module and it doesn’t e.g. sport the brilliance of Jonathan Nelson’s A24, but it is a damn fine adventure, particularly for veterans of the game. It also acts as a nice alternate means of introducing the power-dynamics of Rybalka and the Vikmordere, if your players have left the first couple of levels behind already, as this establishes the key themes and leitmotifs of the series rather well. So yeah, all in all, this is a thoroughly enjoyable adventure and an impressive beast, particularly for a newcomer. My final verdict will clock in at 5 stars, with my seal of approval added for being a freshman offering. You can get this atmospheric, flavorful module here on OBS!